Is any friendship ever pure? Cemented in a genuine affection and admiration for one another? Or, must something impure enter in, something like jealousy or power or insecurity? I think of my early friendships, coming into them completely trusting because of the respect I experienced in my childhood home, and feeling so betrayed at the first sign of deceit. It was inconceivable to me that someone would want to trick me, or steal from me, or lie to me. I stumbled into first grade already a bit jaded after trying to be friends with a little girl in our neighborhood who did those things relentlessly. So it intrigues me that Elena Ferrante has written a trilogy, the Neopolitan novels, beginning with My Brilliant Friend. It’s a brilliant title, for one thing, because Lila Cerulla embodies everything that I found both alluring and daunting in my own friendships. and yet, maybe brilliant refers to Elena Grecco. She is beautiful Lila’s friend, brilliant not in social prowess, but in Italian, Latin and Greek. In school, she is brilliant. These two contrasting friends offer much for us to consider. We weigh the friendships we’ve harbored in the past as well as today; we review our childhood and the goals instilled in us by our parents or our own rebellious hearts. Lila marries Stefano at sixteen years of age. She is a beautiful bride. Her friend watches the ceremony feeling plain and in many ways unequal. But, to whom can we find equality? We can only be who we were meant to be, independent even within the closest of friendships. It was Jacqui’s review which encouraged me to revisit My Brilliant Friend when first I laid it down. Also, Nicola had a hand in my picking it up again. Now I’m eager to see where Ferrante takes us in Book Two: The Story of a New Name. Previous Post Christmas Eve Eve…and a Merry Christmas to You All! This is actually the second time I’ve picked it up, but the first I’ve completed it. 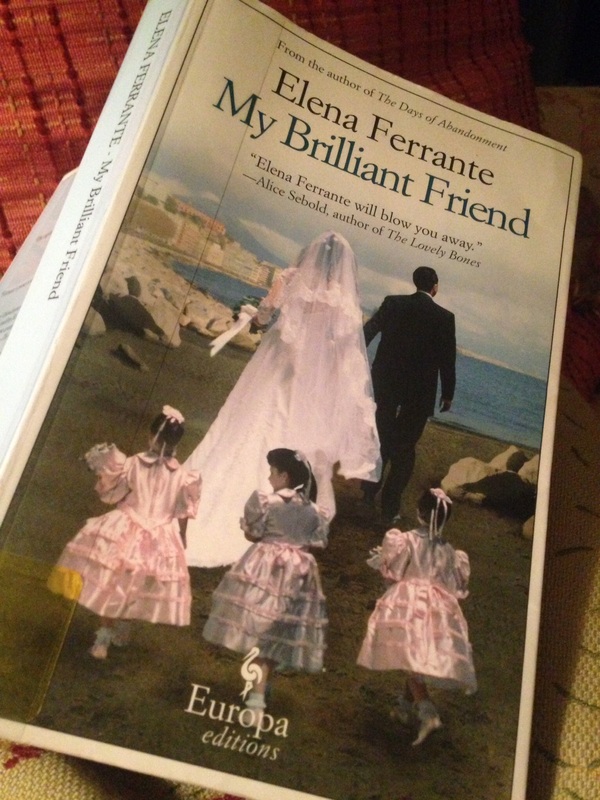 I really was absorbed in Elena Ferrante’s Days of Abandonment, and I couldn’t “get into” this friendship series. But, after seeing so many bloggers I respect, particularly Jacqui who comments further down, write such positive reviews I was determined to try it again. It’s a deceptively simple novel, in some ways. You think, “I’m just reading about two girls, what’s the big deal?” and then you find yourself thinking about them for hours, and their parents, and city and the other characters. It was such a surprise to me to be so caught up in the story, in their lives. Thank you for linking to the article here, I’ll go read it as soon as I respond to the comments. Coincidences are funny in our book loving world! I guess we have more in common, or occurrences that happen because we’re readers, than other bloggers. Ah, you went back to My Brilliant Friend, and it sounds as if you enjoyed it this time! As you know, I’m a huge fan of these novels, particularly the first two. Ferrante is very good at conveying the little shifts in dynamics and balance of power between the two girls, and I love the way she depicts the Naples neighbourhood. I like how you’ve described Lila as there’s dark side to her dazzling brilliance. Were you aware that the trilogy has become a tetralogy? There’s a fourth book on the way next year (already available in Italian). I was thinking about the word “brilliant” last night, certain that it referred to Lila’s personality when it occurred to me that of course! it could also apply to Elena’s brilliant mind. Such a good title with complex applications. I’m so glad you found the right time for this one and I can understand why you’re keen to get to book two! I hope you enjoy it just as much as the first instalment. I think I’m out a limb in preferring MBF over New Name (albeit by a small margin) so I’ll be interested to hear how you fare. Many thanks for adding a link to my review, very kind. The meaning of Brilliant. Yes, it’s very interesting to consider how that word applies to both girls, and as you say the source of Elena’s brilliance is quite different to Lila’s. This is one of the books I’m most excited to read in 2015! It’s loaded on my kindle and ready to go. Oh, I can’t wait to discuss it with you when you’ve read it! Do you plan on reading all four? Or, maybe it’s too early to tell right now. I’ve read the entire series and really enjoyed them. And, by the way, I think you and I may have has the same mean friend…….we stayed friends from grades 1-4 and she made me sad more often than happy, until I finally got the courage to find a new best friend. I think we’ve talked about mean girls from our youth before, Diane. Somehow they just won’t go away! I guess it’s part of growing and learning, this sticking up for ourselves that we must acquire. I don’t mean to imply that Lila is unkind to Elena as I was deliberately lied to or tricked. I was just recalling those incidences in my youth as I read about theirs. However, it occurs to me that in many friendships there can be an element of power which switches from time to time between the two people. Under three dollars?! I have to go see if it’s still such a fine price. We’ll have to talk about it, and the other two, when we finish them. Edgar, thanks for the link which I’m eager to go read. Booker Talk left me a link to Elena Ferrante as well, in an earlier comment today (above). It’s interesting how much mystique surrounds this author, and how her books are catching on. If, indeed, the author is a “her”. The next two in the trilogy are waiting for me in the new year. I enjoyed the second half of this one far more than the first part. I felt that in the second half we not only have a better concept of from where the balance in their relationship stems but greater insights into the little self-deceptions in which we all engage and how those impact our friendships. Those reflections formed a very personal connection for me with the text. I, too, found myself more engaged during the second half of the novel. I don’t know if you had a “friend” as Diane and I discussed briefly above, who really was more of an enemy, but that effected a lot of my reading in the beginning. I couldn’t quite free myself of those memories. But, once the girls were beyond ten years of age, and starting in romantic relationships as well as more complex relationships with each other, I found more personal connections to them. Read em all now! I got completely absorbed and read solidly throughout December, but now I have a bit of perspective and can think more critically about them. It’s a remarkable study of friendship but it has to be said neither Lila or Elena are particularly pleasant characters. Of course, I will be reading the fourth book but we have to wait until September 2015. Somehow, I’m not surprised to hear you say that neither Lila nor Elena are particularly pleasant. I can see manipulative tendencies on both of their parts, and I haven’t even begun Book Two. I’m itching to start, though, and may abandon waiting for it to come into our library and just download it on my kindle. Isn’t is frustrating to wait for an author’s book to come out?! That happens with me and Haruki Murakami all the time! I just layed this novel aside and moved on to an other…oh well!! now after reading your review I want to pick it back up. I will eventually, I bought the three. I can emphazise with both characters, I have such a friend. We both wanted to make a life in the United States and it happend! today we live in different States yet things between us did not turn out quite as we tbought. This was what attracted me to these three novels. Why I put it aside? I do not know, my mood at the time. I wasn’t sure why I put it aside, either. Now I’m compelled to see all that Ferrante has to say about friendships, family, and Naples. I wonder if most of us have had such a “friend”…one to whom we’re driven, even though we’ve been wounded, at the same time,. I saved this to be my first read of 2015 and at first I was disappointed – it was nothing like I thought it would be. But I’m glad I kept reading. I’m going to let my thoughts settle in about it and write a post soon. I had to give this a second try, too. The first time I picked it up, read 20 pages, and couldn’t get farther. i’m not sure why that happens, because now I’m so eager to begin Volume 3! Looking forward to your thoughts, Lu.